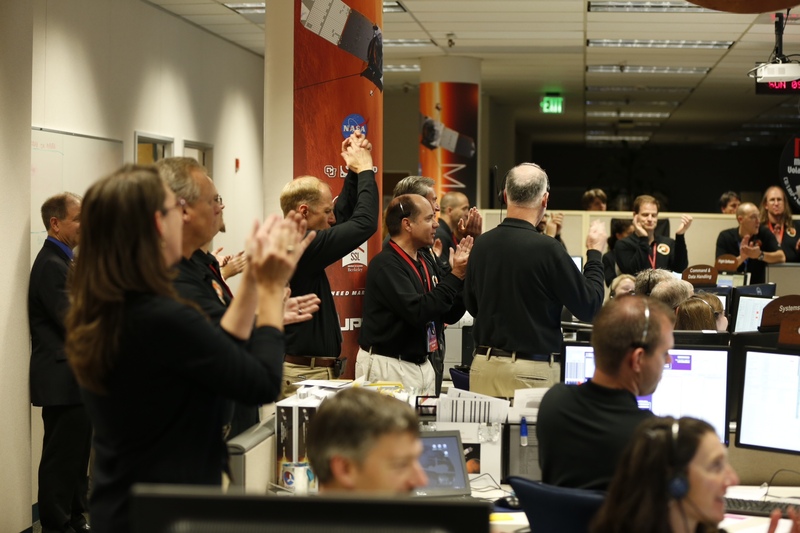 Members of the mission team at the Lockheed Martin Mission Support Area in Littleton, Colorado, celebrate after successfully inserting NASA’s Mars Atmosphere and Volatile Evolution (MAVEN) spacecraft into orbit around Mars at 10:24 p.m. EDT Sunday, Sept. 21. 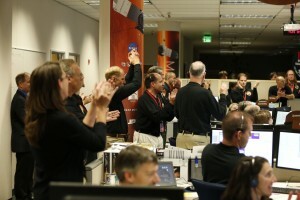 After a 10-month journey, confirmation of successful orbit insertion was received from MAVEN data observed at the Lockheed Martin operations center in Littleton, Colorado, as well as from tracking data monitored at NASA’s Jet Propulsion Laboratory (JPL) navigation facility in Pasadena, California. The telemetry and tracking data were received by NASA’s Deep Space Network antenna station in Canberra, Australia. Following orbit insertion, MAVEN will begin a six-week commissioning phase that includes maneuvering into its final science orbit and testing the instruments and science-mapping commands. MAVEN then will begin its one Earth-year primary mission, taking measurements of the composition, structure and escape of gases in Mars’ upper atmosphere and its interaction with the sun and solar wind. The primary mission includes five “deep-dip” campaigns, in which MAVEN’s periapsis, or lowest orbit altitude, will be lowered from 93 miles (150 kilometers) to about 77 miles (125 kilometers). These measurements will provide information down to where the upper and lower atmospheres meet, giving scientists a full profile of the upper tier. MAVEN launched Nov. 18, 2013, from Cape Canaveral Air Force Station in Florida, carrying three instrument packages. The Particles and Fields Package, built by the University of California at Berkeley with support from CU/LASP and Goddard contains six instruments that will characterize the solar wind and the ionosphere of the planet. The Remote Sensing Package, built by CU/LASP, will identify characteristics present throughout the upper atmosphere and ionosphere. The Neutral Gas and Ion Mass Spectrometer, provided by Goddard, will measure the composition and isotopes of atomic particles. MAVEN’s principal investigator is based at CU/LASP. The university provided two science instruments and leads science operations, as well as education and public outreach, for the mission. The University of California at Berkeley’s Space Sciences Laboratory also provided four science instruments for the mission. Goddard manages the MAVEN project. Lockheed Martin built the spacecraft and is responsible for mission operations. JPL provides navigation and Deep Space Network support, as well as Electra telecommunications relay hardware and operations.